I’m down with a nasty stomach bug and Millie is running fever…so no post today. But I’ll be back tomorrow (hopefully!) with my spending hiatus post. hope you and your little one feel better very soon. it's no fun, i know. Hope you feel better soon - there's nothing worse than being sick as the same time as your little one. Sorry to hear you and millie are both under the weather. Hope you both have a restful day and feel better soon! well wishes your way for you and your family!!! ugh, being sick is no fun! i hope you and millie both are up and at 'em by tomorrow :) feel better! I send you smiles and sun, it always help to get better! 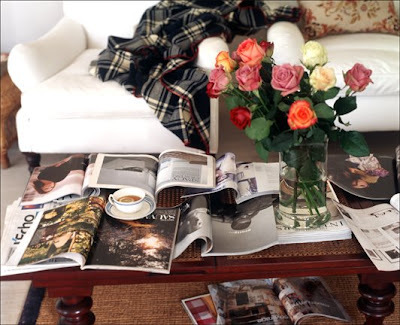 Nice picture, so cozy, inspiring for a relaxing day... Love your blog!